The STANDBACK V2 is a heavyweight bag. It has the gravity and weight of a Nose Tackle who won’t give ground easily. Powerful leg drive is needed to block this dummy. 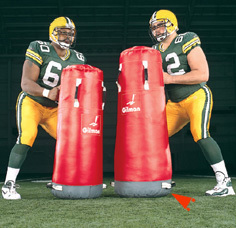 It’s the football dummy of choice for Wing “T” teams that emphasize shoulder blocking skills. Use it to teach the mechanics of hip explosion and shoulder blow delivery. Ideal for drilling play-oriented blocks such as the cross, trap, post-lead, counter-iso, and reach-fire. Offers the proper aiming point and height for high school players. Measures 18" in diameter by 43" tall. Six handles.